A refreshing - and patriotic! - white sangria. Red strawberries, white wine, and blueberries ... and even some star fruit to complete the picture. I’m kind of into the dorky over-the-top holiday themed stuff. I know I’m a dork. I own it, for the most part. Sometimes I think it would be cooler to be, well, cool – but then I look in the mirror or hear the words coming out of my mouth and I laugh at myself. I am what I am. May as well embrace it. But enough about me. How about America, and freedom, and liberty, and justice for all? 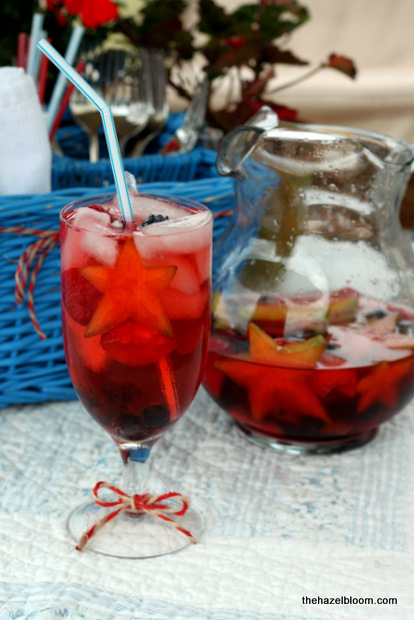 And how about celebrating the day of independence with a tasty, dorkily themed beverage like Fourth of July Sangria? That’s right, my friends. 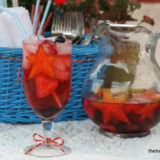 We’ve got a nice refreshing white sangria with star fruit. And strawberries and blueberries and wine and deliciousness and good times. So how about getting dorky with me for your very own Fourth of July celebration? Jump on in to the uncool pool with me. The water is, actually, pretty fine. Add the strawberries, blueberries, star fruit, and cherries to a pitcher. Pour in the wine and the pomegranate schnapps. Cover and let sit in the refrigerator for at least 6 hours - or, preferably, overnight. To serve, fill a glass about 2/3 of the way full with ice cubes. Pour the sangria in about 2/3 full, and add a few pieces of the fruit. Top off with club soda. I love it. The star fruit! What a good idea and the little red and white string around the bottom just finish’s it off. Cute! Cute! Cute! 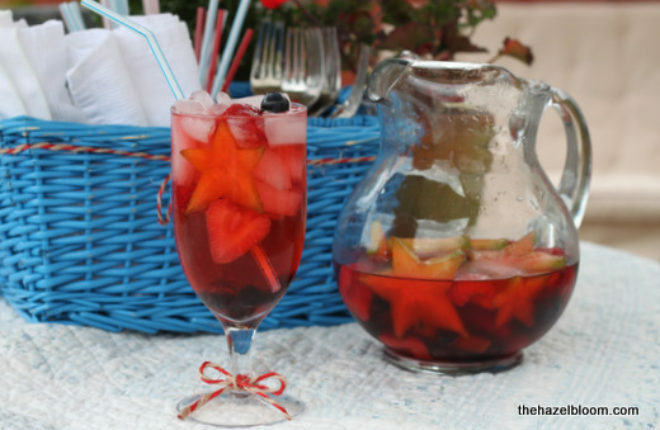 Stars in your sangria! I love it. I think it is great, besides dorks totally rule! i love mix fruits.. totally taste good and yum.